Short on ideas to generate unique number to serve as password? 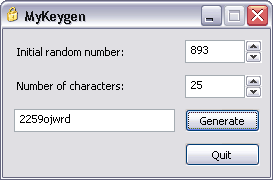 MyKeyGen is a small portable utility to get enough ideas, inspiration and random numbers to be your next password for any application or service access. It can generate random numbers including different digits and alphabets. 1. Download MyKeyGen and unzip downloaded file. 2. Double click to launch the Key Gen program. 3. Click “Generate” button to see random number. Alternatively, you can generate selective numbers by mentioning ‘Initial random number’ and ‘Number of Characters’. Simple and quick way to get unique number for secure passwords, what say?